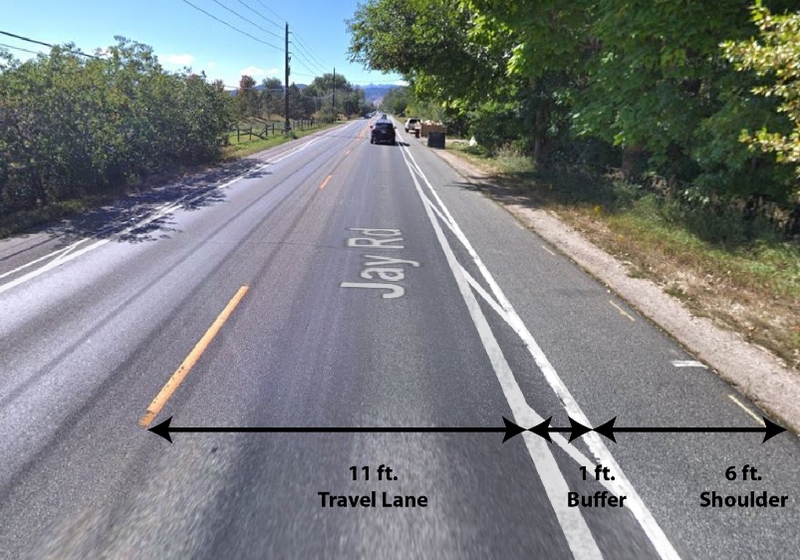 Jay Road serves as an important connector between Boulder and Gunbarrel and sees some of the highest vehicle and bicycle volumes of any county road. Unfortunately, it also has some of the highest numbers of bicycle-vehicle crashes of any unincorporated county road. Between 2006 and 2018, two-thirds of bicycle-vehicle crashes on Jay Road are the result of conflicts between turning vehicles and cyclists traveling straight. Between 30th and 63rd streets – striping a one-foot buffer to separate the travel lane from the shoulder. Between 30th and 75th streets – applying green paint to the shoulder to highlight the shoulder and bike lane at intersections. The image below shows what Jay Road will look like between 30th and 63rd streets. Jay Road is 36-feet wide between 30th and 63rd streets. Currently, the road is striped with 12-foot wide travel lanes a six-foot wide “bikeable” shoulder. 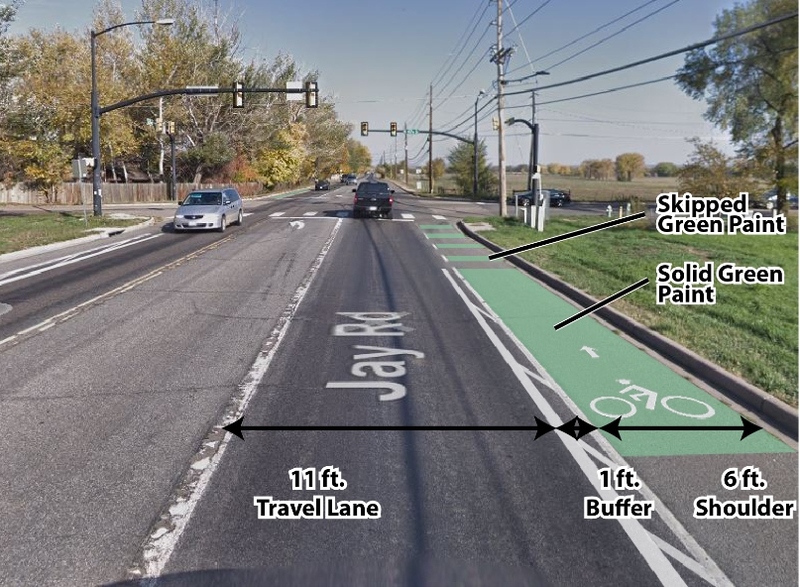 We are proposing to keep the shoulders six-feet wide and stripe a one-foot wide buffer in each direction to narrow the travel lane to 11-feet wide. The edge-line stripe separating the travel lane from the buffer will be six-inches wide. Between 63rd and 75th streets, the pavement is 30-feet wide and is striped with 11-foot wide travel lanes and four-foot wide “bikeable” shoulders. Travel lanes must be kept to a minimum of 11-feet wide, so we don’t have room for the striped buffer east of 63rd Street. The image below shows what Jay Road will look like at intersections between 30th and 75th streets. At intersections, we are proposing to apply green paint to highlight the “bikeable” shoulders and bike lanes up-to, and in some cases through, the intersections. In advance of the intersections, the buffers will transition to “skipped” striping to indicate that right-turning vehicles can enter the shoulder. This fall, we’ll start a Jay Road intersection improvement project to improve pedestrian safety at 30th Street, St. Croix Street, and Lonetree Court. The project includes adding pedestrian refuge islands that will help people safely cross one lane of Jay Road at a time, rather than having to find a gap in both east- and westbound traffic simultaneously. These improvements are taken from the Boulder County Mulitmodal Transportation Standards. In addition, we are also evaluating potential changes to signal timing/phasing at intersections with traffic lights along Jay Road. We are currently considering different trail alignments that would complete the missing link in the LoBo Trail system along Jay/Spine Road. Visit the project website to learn more.